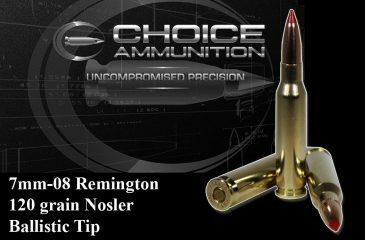 7mm-08 140 Grain Nosler Ballistic Tip~ The 7mm-08 Remington works in most hunting environments, including dense forest areas and large open fields. Of cartridges based upon the .308, it is the second most popular behind only the .243 Winchester. It has a flatter trajectory than the .308 Win. and .30-06 Springfield at similar bullet weights because the slightly smaller-diameter 7mm bullet generally has a better ballistic coefficient (BC), and is thus less affected by drag and crosswind while in flight. Its trajectory is comparable to the .270 Winchester. Its recoil is a bit more than a .243 Win. and less than most loads in a .308 Win. This mild recoil makes it suitable for youth and adults who are new shooters; however, the cartridge serves experienced shooters and hunters equally well. Choice Ammunition has taken our 100% hand-loading techniques and produce an extremely accurate, highly dependable round for the 7mm-08 in this load. Our loading tolerances are only matched by passionate hand-loaders in their own loading rooms. Consistent seating depths, powder charges and proprietary formulas of Choice Ammunition, make this 140 grain Nosler Ballistic Tip round the best you can buy on the commercial market today. 7mm-08 139 Grain Hornady SST~ The 7mm-08 Remington works in most hunting environments, including dense forest areas and large open fields. Of cartridges based upon the .308, it is the second most popular behind only the .243 Winchester. It has a flatter trajectory than the .308 Win. and .30-06 Springfield at similar bullet weights because the slightly smaller-diameter 7mm bullet generally has a better ballistic coefficient (BC), and is thus less affected by drag and crosswind while in flight. Its trajectory is comparable to the .270 Winchester. Our 100% Hand-Loaded 7mm-08 139 Hornady SST rounds are loaded with extremely tight tolerances, producing highly accurate, consistent and reliable performance with each and every shot! We feel our proprietary load formulas and loading process create the finest round of ammunition available on the commercial market today. If you don’t load your own ammunition- let us do it for you! 7mm-08 140 Grain Berger VLD-Hunting~ The 7mm-08 Remington works in most hunting environments, including dense forest areas and large open fields. Of cartridges based upon the .308, it is the second most popular behind only the .243 Winchester. It has a flatter trajectory than the .308 Win. and .30-06 Springfield at similar bullet weights because the slightly smaller-diameter 7mm bullet generally has a better ballistic coefficient (BC), and is thus less affected by drag and crosswind while in flight. Its trajectory is comparable to the .270 Winchester. 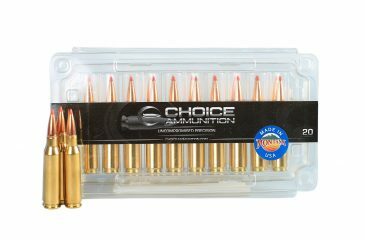 Choice Ammunition has taken our 100% hand-loading techniques and produce an extremely accurate, highly dependable round for the 7mm-08 in this load. Our loading tolerances are only matched by passionate hand-loaders in their own loading rooms. Consistent seating depths, powder charges and proprietary formulas of Choice Ammunition, make this 140 grain Berger VLD-Hunting round the best you can buy on the commercial market today. 7mm-08 140 Grain Nosler AccuBond~ The 7mm-08 Remington works in most hunting environments, including dense forest areas and large open fields. 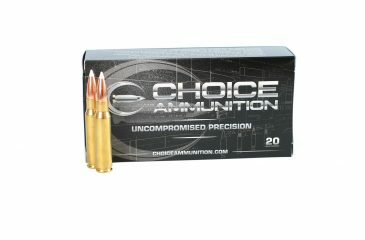 Of cartridges based upon the .308, it is the second most popular behind only the .243 Winchester. It has a flatter trajectory than the .308 Win. and .30-06 Springfield at similar bullet weights because the slightly smaller-diameter 7mm bullet generally has a better ballistic coefficient (BC), and is thus less affected by drag and crosswind while in flight. Its trajectory is comparable to the .270 Winchester. 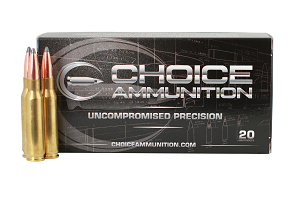 Choice Ammunition is proud to release the AccuBond for our 7mm-08! Our 100% Hand-Loaded, premium ammunition is perfect to compliment this caliber. You will find our proprietary formula to be loaded with extremely tight loading tolerances, providing the most reliable, accurate and dependable round of ammunition available. Nosler’s AccuBond bonded core bullet. Through a proprietary bonding process that eliminates voids in the bullet core, AccuBond marries Nosler’s traditional copper-alloy jacket with its special lead-alloy core. The result is a bullet that flies true, penetrates deep, won’t cause extensive barrel fouling, and will retain 60-70% of its weight. The white polymer tip helps protect against deformation while initiating expansion upon impact. The result is a bullet that flies true, penetrates deep and retains its weight, without causing extensive barrel fouling. Nosler’s Solid Base at the rear of the bullet acts as a platform for large diameter mushrooms. 7mm-08 140 Grain Nosler Partition~ The 7mm-08 Remington works in most hunting environments, including dense forest areas and large open fields. Of cartridges based upon the .308, it is the second most popular behind only the .243 Winchester. It has a flatter trajectory than the .308 Win. and .30-06 Springfield at similar bullet weights because the slightly smaller-diameter 7mm bullet generally has a better ballistic coefficient (BC), and is thus less affected by drag and crosswind while in flight. Its trajectory is comparable to the .270 Winchester. 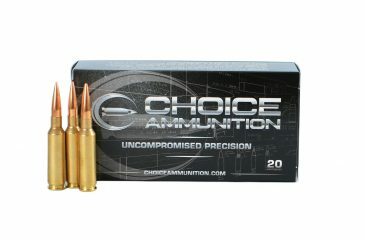 Choice Ammunition has taken our 100% hand-loading techniques and produce an extremely accurate, highly dependable round for the 7mm-08 in this load. Our loading tolerances are only matched by passionate hand-loaders in their own loading rooms. Consistent seating depths, powder charges and proprietary formulas of Choice Ammunition, make this 140 Nosler Partition round the best you can buy on the commercial market today.